Officially known as the Taipei International Financial Center (tái běi guó jì jīn róng dà lóu 台北国际金融大楼), this 101-floor, 508-meter high skyscraper is in the Xinyi District (xìn yì qū 信义区) of Taipei (tái běi 台北) and is the second tallest skyscraper in the world. The tower is rich in symbolism; it was designed to resemble bamboo rising from the earth, a plant recognized in Asian cultures for its fast growth and flexibility, both of which are ideal characteristics for a financial building. Taipei 101, with a mass of shops on the lower floors, incorporates many top brands under the LVMH group, such as Louis Vuitton, Dior, Celine, etc. The fourth floor houses the Page One bookstore from Singapore, with the highest-roofed coffee house in Taipei and many fine restaurants. The Sun Moon Lake (rì yuè tán 日月潭), located in the middle of Taiwan, with an elevation of 748 meters above sea level, is the only natural big lake in Taiwan (tái wān 台湾). 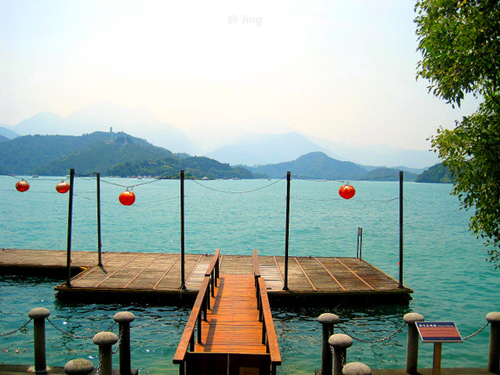 The southern part of Lalu Island (lā lǔ dǎo 拉鲁岛) is shaped like a new moon, and the northern part is shaped like a sun; hence the name Sun Moon Lake. Sun Moon Lake sits at an altitude of 762m in the mountains of Nantou County (nán tóu xiàn 南投县), in central Taiwan. 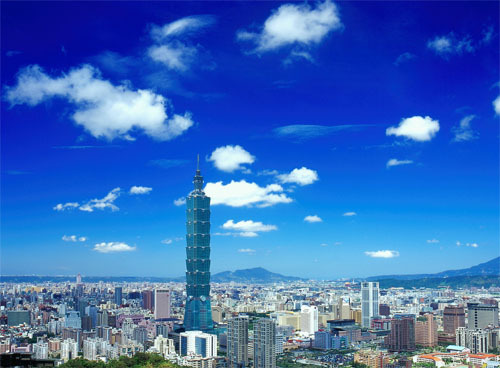 With good weather year-round, accessible sights and tons of outdoor activities to offer, it’s not surprising it's one of Taiwan's most renowned tourist destinations. 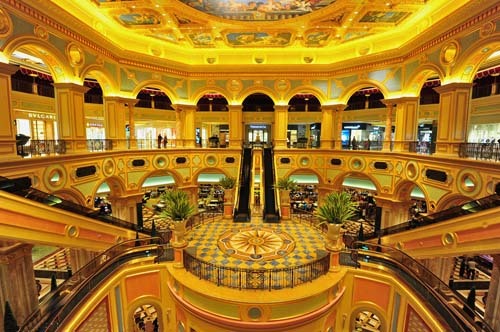 Grand Lisboa Hotel (xīn pú jīng jiǔ diàn 新葡京酒店), is an iconic building set in the heart of Macau, is a testament to extraordinary elegance. With its distinctive location and architectural design, 12 acclaimed restaurants and 24-hour entertainment, the Grand Lisboa has truly earned its reputation as one of Asia’s finest casino hotel. The building that, for many years, was the head-office of RTP (National Portuguese Television) has now been converted into a modern 5-star hotel with its doors open to the world. 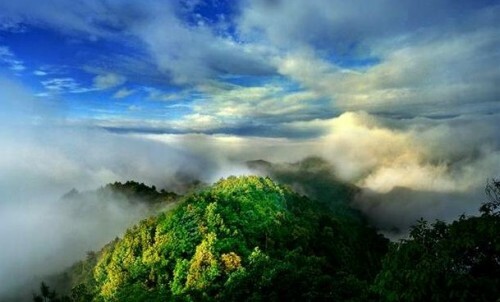 Known as eco-tourism area of Niumulin（Niúmǔlín 牛姆林）, located in Quanzhou (Qúanzhōu 泉州), Fujian Province Western Yongchun County, 70 km away from the county is a national 4A grade tourism area, the first Nature Reserve in Fujian Province, Fujian Province, ecological education base, popular science education base and a small civic morality demonstration bases, is one of Quanzhou 18 King. Niumulin pregnant named because of the situation if the cattle Farm. Its name just like its outside shape so it was called Huai Bao (Huái Bǎo 怀宝). Located in Southeast Macao, A-ma temple (mā gé miào 妈阁庙) is an excellent temple experience and a significant location for local and Chinese history. Tourists interested in history and local religious customs, this is a must stop. A-ma temple was formerly known as Motherly Matriarch Pavilion and was traditionally called Heavenly Matriarch Temple. A-Ma Temple, with a history of over 500 years, is the oldest temple among the three ancient temples in Macau. 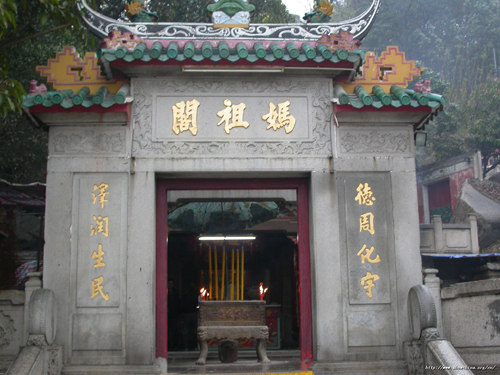 The other two are Kun lam Temple (guān yīn tang 观音堂) and Lin Fong Temple (lián fēng miào 莲峰庙).It was built during the Ming Dynasty to make sacrifices to the Motherly Matriarch.